A low-glycemic, raw, vegan dessert just in time for summer solstice. Call me a rebel but I like eating salad for breakfast. 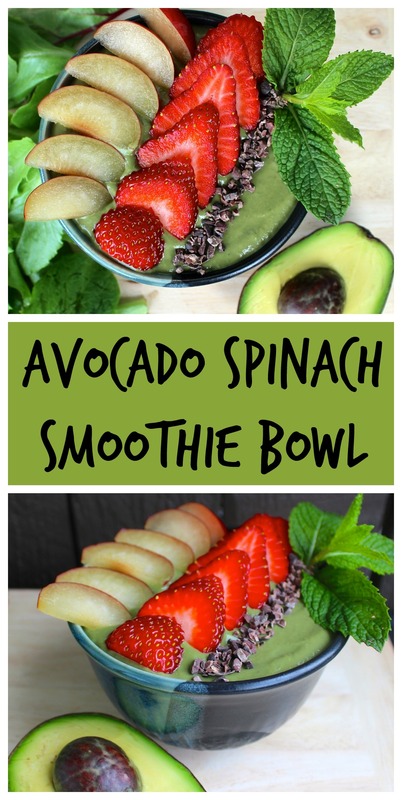 Spinach is the featured ingredient in this smoothie bowl because it is a champion at providing many vitamins and minerals including the following inflammation-fighters: vitamins K, A, C and B6. It’s also an excellent source of folate, magnesium, and calcium. I included vitamin C-rich strawberries to help with iron absorption (if you are trying to boost your iron intake, greens like kale and swiss chard may be more beneficial than spinach). Most uniquely, spinach contains various plant compounds including kaempferol, which has been shown to reduce the risk of cancer, and nitrates, which have been shown to decrease blood pressure. Avocado is the other green superfood featured in this breakfast bowl. A meta-analysis published earlier this year concluded that including avocado in our diets can assist in lowering total cholesterol, LDL cholesterol and triglyceride levels. Also, its omega-3 content can help lower inflammation. P.S. This smoothie bowl is banana-free! Previously, frozen bananas were my not-so-secret ingredient for achieving a thick consistency, however, in an effort to decrease my banana consumption I have discovered dairy-free yogurt makes a great alternative. Do you have other ideas for replacing frozen bananas? Let me know in the comments below! Plan and prep your toppings so they are ready for decorating. Blend spinach, avocado, and yogurt together using a blender or food processor. Add protein powder and liquid (only enough to blend completely). Pour (or scoop) thick smoothie into a bowl. TIP: If I want it colder I sometimes pop it in the freezer now for about 20 minutes as I get myself ready for the day OR place a few ice cubes at the bottom of the bowl. Sneaky, right? Decorate with toppings and admire your work of art.